Times are tough and the days are growing short. It is difficult to stand in faith as the darkness fills the world. Sometimes the pain we experience is just too much for us to bear. Many may wonder if God is truly with them in all things. For instance, where is God when a loved one dies or when bad things happen to innocent people? This question and other similar ones have troubled believers everywhere. The truth that remains is that God is with us in everything and anything that comes against us. God’s plan was for us to live in paradise with him forever, but because of man’s sin, death and destruction came into our world. But the love of God never left us. His love for us was so great that he was willing to sacrifice the blood of his Son Jesus to bring us back to fellowship with him. God’s love for us continues even though we are sinners who turned from the ways of God. To the ends of the earth, God has sent his word to seek out the lost and offer the free gift of salvation through the cross of Jesus. And though this world is perishing, those whose hope is in Christ will never be destroyed. Death that can take the body can never touch the soul of a believer. Jesus said in John 5:24, “Whoever hears my word and believes him who sent me has eternal life and will not be condemned; he has crossed over from death to life.” That means that no sickness,financial problems, divorce, pain or even death can end God’s promise for us of victory and eternity with him. Life on this earth is fleeting. Eternity with God is never-ending and it is there that you will understand that the storms in your life were only the winds that brought you closer to the reward that God has prepared for you. You will know then that God never left your side despite what you had to suffer. 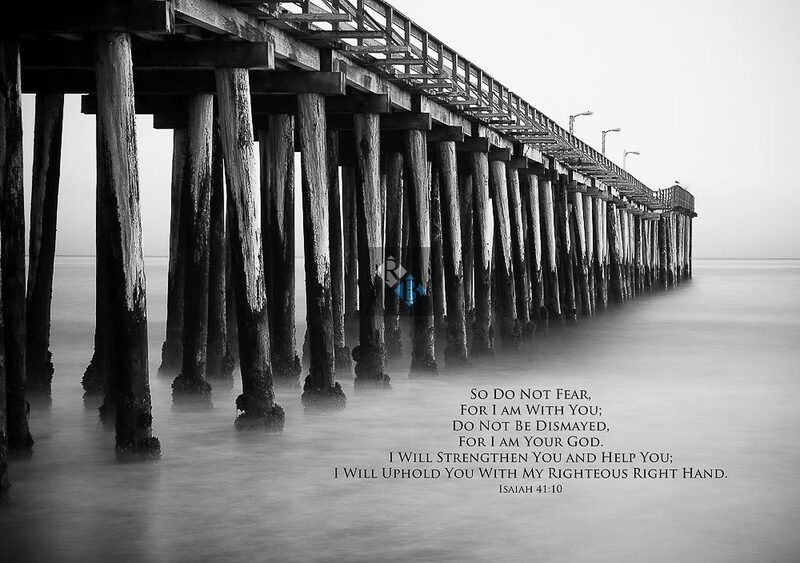 The strength to endure and not to fear was always with you and that his power was manifested in your weakness. There will always be death and evil on this earth until Jesus comes back. That is why as believers we must not conform to this world but be set apart. We must live different lives and not react as those who have no hope. The sickness or loss of someone close to us may tear at our heart, but our strength must come from the hope that God has given us. Our life on this earth is not the end. Innocent people will continue to suffer at the hands of evildoers and sickness will take loved ones from this earth, but God’s justice and purpose will always prevail. We must trust that God will use for good all that comes against us. The Apostle Paul suffered torture and pain in his life, but he knew that it was all going to be used for the glory of God. For him, to die was gain but to live was for Christ. He knew that God had an eternal purpose for everything that he had to endure. When we don’t understand the reason God allows pain and suffering in our lives and those whom we love, we must have faith that God is always at work in us, and that those who endure to the end will receive the reward that far outweighs it all! The trials of this earth are temporary, but the reward of God is eternal. For now, I pray that you understand that God will be with you in your pain and will take you through the valley of your tears. He is always faithful! Dear Lord, the pain and burdens of this world can bring us to our knees. Sometimes we falter in our faith as we struggle against the war that the enemy is waging against us. I pray that those who may have experienced a loss of a loved one or who is being overwhelmed by a situation that seems hopeless. Fill them with your peace and love. May they know that no problem is bigger than the God that they serve. Help them to understand that your ways are higher and better than ours. Give them the strength to persevere in the battle and to keep their eyes on you. Your perfect plan for their life will never fail! We give you praise. Amen. Hi Lorenzo, that is good insight into this tough question of where is God when bad things happen. We will never have all of the answers here. Even King David asked God how long will the evil prosper while those righteous suffer. I think the message God gave me on this topic is that though we suffer a little while, he will make all things right in due time. There is so much darkness in this current world that the only way to survive is to hold on to the light of Jesus Christ and hide his words in our heart so that we can remain strong even when we don’t understand why he allows things. I just remember that God didn’t cut any slack with the Apostle Paul who he sent to preach the gospel to the world. He was beaten, stoned, imprisoned and still had to work to earn his food all the while he was doing God’s work! That’s pretty tough to understand. I pray that I can grow in the understanding that I need to stay the course that he planned for my life. Hi again Marianne- Yes I agree, things are so hard to understand sometimes. Some of the great men of the Bible were persecuted, killed and exiled for their belief and doing Gods work, while others in our day are living some great financially free, comfortable God filled lives and yet others are doing His work and struggling just to pay a weeks rent and buy bread and milk. But you are right, we will never have ALL the answers here while on earth. BUT if we were meant to know and understand it all NOW, then I believe God would reveal it all now. But then, where would “faith” be a needed factor to live? It is ONLY with Faith that we can please the Lord. We can see here that all Jesus said was to “WAIT” for how long, the apostles did not know. If our Lord told them a specific time, (like say 10 days) then where would the faith had been needed for them to wait? Hebrews 11:1 states “Now faith is the substance of things HOPED FOR and the evidence of the things NOT SEEN” So it was there faith that was tested again and called upon to wait for something. So basically, in the mist of all our trials, fears, confusions and aggravations, we need to just TRUST in the one who knows ALL the answers, and WAIT for the promises of our Lord to manifest. WE are weak at times, flawed, but it is Christ we can do all things through. it is HIM who is strong when we are weak. it is HIM who says delight ourselves in Him and He will give us the desires of our heart. it is HIM who says I WILL per-fect ALL that concerns you. all in all my sister IT IS HIM. Glory to God. I truly know that waiting on God and suffering for him has a purpose that far outweighs what we go through. Remember, Lucifer and all the angels were in the face of GOD and yet somehow Lucifer convinced 1/3 or them that there was something better!!? As incredulous as that sounds, Satan himself believed it. But God created man and told Satan that he would make a people, who would never see him physically nor for the most part ever hear him audibly, yet, he told Satan that despite the suffering and pain, there would be those who would put their trust in him. You see, our faith is what is defining us as those who belong to the King We suffer unjustly daily yet our hope is still in him. You can believe with all of your heart that when we get to glory with Christ, there will never be a time when someone thinks it can get better! We who are being refined now will understand the greatness of the gift of eternity with God. God has a perfect plan for our lives. Troubles that come to us here on earth serves a purpose. Troubles may be to prepare us for a new level in life, may be to strength us for challenges or may be to preserve us for a better future. Remember Joseph who was betrayed by family members and thrown in a dry pit to die, he become a king. As children of God, we need to understand that satan is the author of all the afflictions and pains. Calling on the name jesus, confronts satan and lives us. When we face trouble we need to confront satan in the name of jesus christ. We need to ask God to give us understanding and the purpose for every situation in life. At last as children of God, when our goings are good, say “Jesus is the Lord” and when the goings are worse say: “Jesus is the Lord”. Amen! I thank God for directing me toward this site; which I believe I didn’t just come across by chance…I’m dealing with some emotional pain from a near 3 year relationship which seems to be on the verge of ending without warning…it hurts, to say the least and what hurts most seems to be the hellish thoughts and doubts my mind comes up with. Feeling trapped in ones thoughts, know what I mean? I get what he’s doing; I’ve had a habit of placing the people i love before him and I think he’s trying to break me of it so I learn to depend on him fully..but it still hurts and seems to weigh a ton more, the more I find myself thinking of it..I’m sorry for droning on; I’m usually against opening up my thoughts and feelings to people but I just wanted to share the background as to why your posts have touched me so deeply. All of this is happening for a reason and I’m trying to trust that I’ll come out stronger. It sounds kinda like a prophecy. What is written here is happening today. God bless and I love ya.